TWA is proud to provide for download the cover story from the three most current issues of Texas Wildlife. Other editions of Texas Wildlife are available to download in their entirity. Click here to download "Ecotourism on the Ranch" by Naima Montacer. 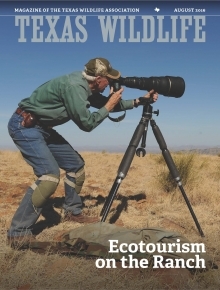 For a printed copy of Texas Wildlife, please contact the Texas Wildlife Association at (800) 839-9453. Please join the organization by clicking here or by calling (800) 839-9453 to receive a 12-month subscription to this award-winning publication. Interested in advertising in Texas Wildlife? The 2016 Media Kit is available. No parts of these magazines may be reproduced or retransmitted in any form or by any means without express written permission by the publisher. Copyrighted 2016 by the Texas Wildlife Association.